The Department of Justice is gearing up to release a report criticising former FBI deputy director Andrew McCabe for authorizing inappropriate disclosures to the media which ultimately resulted in a negative Wall Street Journal article about then-Democratic nominee Hillary Clinton. The article was published on October 30, 2016, days before the November election. McCabe was ousted from the FBI earlier this year, following a string of public attacks from President Donald Trump accusing him of corruption and anti-Trump bias. But McCabe’s actions and the upcoming DOJ report stand in apparent contrast to Trump’s assertions. The Department of Justice’s Office of Inspector General is compiling a report that will fault former FBI deputy director Andrew McCabe for approving disclosures to the media about the Hillary Clinton email investigation in October 2016, according to The New York Times. McCabe was forced out of the FBI earlier this year amid the investigation into his conduct. The Wall Street Journal article at the center of the OIG’s inquiry was published on October 30, 2016, two days after then-FBI director James Comey announced in a letter to Congress that the bureau was reopening its investigation into Clinton’s use of a private email server to conduct government business when she was secretary of state. The article was a highly-detailed account of internal strife within the top ranks of the DOJ about how to proceed after FBI agents investigating former New York congressman Anthony Weiner for sexual misconduct discovered 650,000 emails on his laptop that could have been sent to or from Clinton’s private email server. Many of the emails came from accounts belonging to Weiner’s wife, Huma Abedin, who was also Clinton’s longtime aide and a senior adviser to her campaign, The Journal reported. At the same time, DOJ anticorruption prosecutors were at odds with FBI officials over whether to continue pursuing a separate investigation into the Clinton Foundation’s financial dealings. While DOJ officials believed there wasn’t enough evidence to move forward with the probe and wouldn’t authorise further investigatory measures, FBI officials, including McCabe, believed they had the authority to continue the investigation using whatever leads they had already acquired, the report said. Justice Department rules prevent investigators from taking significant actions that could be seen as trying to influence an election. And when a senior DOJ official called McCabe in August 2016 to express his disapproval with the FBI’s continued focus on the Clinton Foundation probe amid the heated election season, McCabe reportedly pushed back. “Are you telling me that I need to shut down a validly predicated investigation?” McCabe said, according to The Journal. The reporter who authored the Journal’s article, Devlin Barrett, was in touch with two top FBI officials on the phone two days before the story broke, according to text messages released last month. The officials were FBI lawyer Lisa Page, who often worked with McCabe, and then FBI spokesman Michael Kortan. While law-enforcement officials often speak to the press on background in order to provide more complete details about an ongoing story, they are prohibited from revealing information about ongoing investigations, like the Clinton and Clinton Foundation probes. McCabe stepped down as deputy director in January after FBI director Christopher Wray briefed him about the impending OIG report about his conduct. 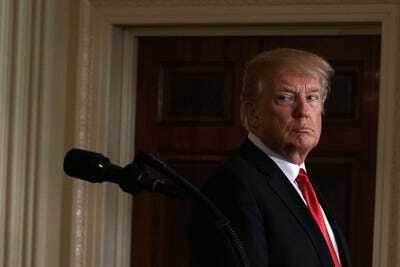 The deputy director’s ouster came following a string of public attacks President Donald Trump leveled against him, accusing him of putting his thumb on the scale in favour of Clinton. Trump’s attacks were based on information contained in a separate Wall Street Journal article published one week before Barrett’s. McCabe’s wife, Dr. Jill McCabe, mounted an unsuccessful run for a Virginia state Senate seat in 2015. The Journal reported on October 24, 2016 that her campaign received $US675,000 in donations from the Virginia Democratic Party and from Common Good VA, the super PAC run by Democratic Virginia Gov. Terry McAuliffe, a longtime Clinton supporter. None of the donations came from Clinton or her family. Trump latched onto the revelations, accusing McCabe of corruption and anti-Trump bias based on his wife’s political campaign. McCabe was not in charge at the time of the Clinton investigation and he did not take on an “oversight role” in the probe until February 2016, long after his wife lost her election bid. The FBI also released a trove of internal emails and documents in January which confirmed that McCabe was not warned against becoming involved in the Clinton investigation but recused himself anyway following The Journal’s report about his wife’s campaign. Most notably, the upcoming OIG report stands in contrast to Trump’s assertion, given its focus on McCabe’s authorization of disclosures that ultimately resulted in a negative story about Clinton. In addition to investigating McCabe’s involvement in officials’ contacts with the press about the DOJ’s internal discussions, the OIG is also probing whether McCabe slowed the bureau’s response after he was alerted to the new batch of emails on Weiner’s laptop. McCabe reportedly became aware of the request to review the new batch of emails shortly after they were first discovered in September 2016, but he did not take action until about three weeks later, in late October.